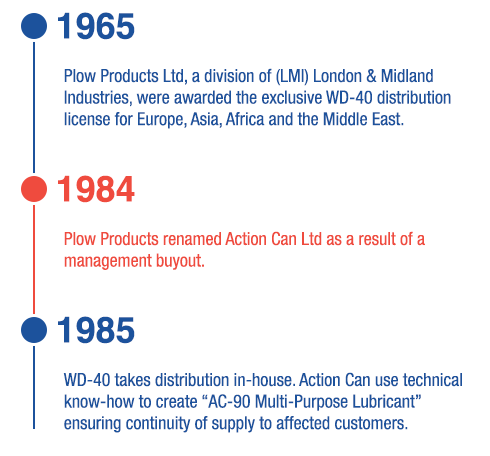 In 1985 we launched AC-90 Multi-Purpose Lubricant onto the UK industrial market, leading to the development of an entire Action Can range launched internationally by 1990. In the three decades since, we have established ourselves as one of the UK’s leading manufactures of professional grade maintenance chemicals. Sold exclusively through wholesale and distributor channels, the Action Can range continues to grow from a handful of core products to an ever-expanding industrial/professional product range. Our manufacturing site is located in Somerset, England and is partnered with the European facility to provide a combined production capacity of over 20,000,000 cans per year. Testing all raw materials upon arrival for specification compliance before blending, again once the bulk batch(s) are ready for filling, and once again after filling, ensures our dedication to specification compliance and consistency, offering reliability and peace of mind that every can of Action Can work just as well as the last. The instantly recognisable and unique graphic illustrations on all Action Can products help users and choosers to identify what the product does; reducing selection confusion quickly, regardless of local/native language. Our regionally based, in-house trained Territory Managers are the first port of call for product enquiries, technical support, point of sale/merchandising and on-site training. With detailed product knowledge, backed up by in-house technical and supply-chain colleagues, they are the brand heroes of Action Can. All Action Can products are available with six languages on the labels: English, French, German, Polish, Greek and Portuguese. Our multi-language product labels allow our distribution partners to supply international markets and assist non-English speakers in identifying product features/safety precautions. 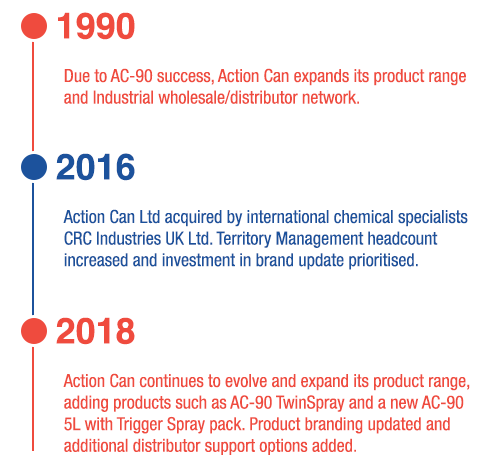 Action Can products have been developed to meet the needs of professional users with a large, 500ml nett fill – because we understand the frustration you have when a can runs out part-way through a job! 24/7/365 availability of safety data sheets (SDS) via our website: www.actioncan.com. Hosted by our international servers, Action Can provide automatically up-to-date safety data sheets – allowing users the peace-of-mind that these essential documents are always up-to-date. In-house technical and laboratory teams for specific application enquiries or technical information. Got a problem but not sure where to turn for answers? Give the Action Can team a call! The Sales and Marketing Teams at Action Can continually evaluate the product range and service mix to ensure we meet our customers’ and users’ needs. 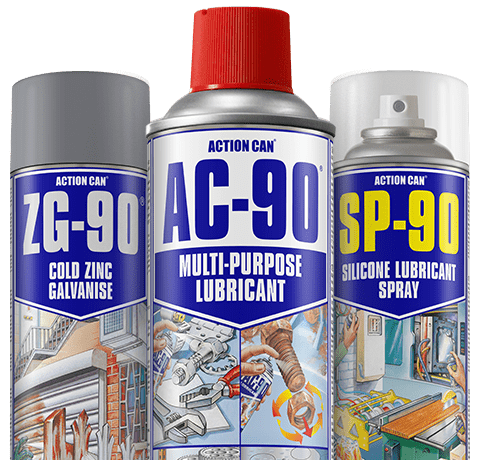 Product feedback is always welcomed, and has resulted in a number of additions to the range, such as the AC-90 TwinSpray and the AC-90 5L with Trigger Spray pack. Whether it is a novel or unique application that requires a product innovation, or simply an idea for an existing product, we are always open to your suggestions. We believe in the quality of our products, but don’t just take our word for it – try them for yourself! Free product samples are available for user application testing, simply request them from the Action Can Sales Managers.